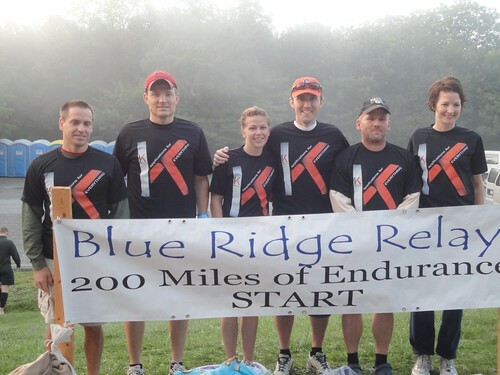 Welcome to the Team 4tunate (to have 2 more runners) Blue Ridge Relay Blog! On this blog you will find periodic updates on our team, our prep for the big day, our fears, dreams, aspirations...you get the picture. It is year 5 for us in the Ultra category, but who's counting? Race Energy – Garbage In, Garbage Out? Post race was filled with more Bojangles than my shrunken stomach could stomach…Mac-n-cheese, egg/cheese biscuit, fries and a large half/half tea. Mmm. Somewhere in the race I ate one of the Luna bars and likely had other snacks here and there. Complimenting a better food strategy needs to be a better sleep strategy. Waking at 3am, driving to the start then running and staying awake until around midnight is not a great strategy. Sleeping after leg 8 is a must as is sleeping somewhere between 14 and 20. Runs with more sleep absolutely felt better than those without sleep – especially as the race grew older. I am still on the fence on whether I’ll return next year. It is a great and unique running experience. I love running in the middle of nowhere in the middle of the night and enjoy the camaraderie of the fellow co-runners. The cost on your body (e.g. tear down to the muscles) is difficult to overcome as is the sleep fatigue that resides for several days after the event. Unfortunately, there are few events that leave you feeling like you miss it when it is all over. This event definitely does just that. Thanks KT Tape for your incredible sponsorship of our team! We loved showing up on your blog! Check us out on the KT Tape blog “The Way We Roll”! 29 hours 48 minutes and 15 seconds after sending Jason M. off down the Grayson Highlands mountaintop start we finished up in Asheville 100% intact with the fanfare that John deserved in his “last Blue Ridge Relay ever!” If you believe that you will have no problem sending me $1,000,000 so I can help educate the needy in a 3rd world country. This time was good enough for 64th out of 120 teams, an 8:36 overall pace and 11th out of 18 Ultra (6 or less) teams. I always put off writing this post every year because there is an odd post-race blues period where you realize it is over and it is likely a year before you get to run an event this cool again. It is also hard to sit down and write because I find it difficult to organize my thoughts into meaningful compartments – even more so than on a normal day. Here it goes. First, a word about our sponsor: KT Tape. This company responded to one of my tweets (which I truly believe is the sign of a company dedicated to their customers) and within days offered to sponsor us with shirts and tape for the race. Most of us were veteran’s of KT Tape usage largely due to the small ailments that come with age. The shirts were super cool and looked great at the start, the finish and in between stages where we weren’t too lazy just to be ok sitting around in our old sweaty running clothes from the last leg. We used both the standard KT Tape which was offered in Purple, Lime Green and Black and was more of a Fabric-based tape. This stuff worked great as usual. You put it on and you always tend to wonder: “What’s this going to do for me – I can hardly feel it on me.” Then you stand up and you get it – the skin pulls away a bit from the muscle and it feels like blood flow in that area is enhanced. We did use the synthetic version of the tape but we all agreed we missed having the pre-cut strips down the center of the tape strip in the event you wanted to apply in different ways. Without scissors, this made using it for the variety of applications we used it for more difficult. Oddly, when ripping off a strip from the roll with this tape it tended to not rip cleanly leaving some of the strings hanging. We also learned that if you don’t apply the tape on clean and alcohol-rubbed body parts the chances of it sticking for a leg of the race were slim. Baby wipes were not the same as a shower and alcohol application. We knew this going in and they folks that applied their tape prior to starting any running had tape on 29 hours later. Those that didn’t often didn’t have tape on at the end of their leg. Again, we knew this but thought some baby wipes and extra hard rubbing (friction) to get it to stick would overcome. Great sponsor, company and concept. BUY THEIR PRODUCTS! Pictures: There’s a “Bermuda Triangle” occurrence in effect at this race. In my 6 years at this race I am pretty sure I don’t have a single documented photo from our team between legs 20 and 28. These legs take place from roughly 10pm and 4am. A camera is the last thing that we think of I suppose. In actuality, it is pretty amazing that we don’t have a complete breakdown in van driving at this point. Simply getting to the next exchange zone is commendable, but I’d love to have more pictures of the amazingness of this race at night. If you are interested a link to our pictures is at the bottom of this post. Van Ripeness: Every time I pick up the van for this event I wonder how they get a relatively used van (31k miles) to smell so new and be so clean? Every time I turn it in I wonder how will they ever get this god awful dirty shoes, mildewy clothes, burp, fart, sweat, gatorade smell out of this van? This mystery becomes more amazing to me each year of the event. The odd part is that it isn’t until the day after the race that I realize how truly bad the smell was. Nemesis: For me, Leg 20 from the Green Valley Fire Department to the Mount Carmel Baptist Church. Sounds innocuous, right? Wrong. My Garmin shows nearly 1200 feet of climbing just under 4 miles of this 6.7 mile leg. That’s steep. I ran it in 69 minutes. That’s short bus slow. Let me be clear: that’s walking nearly the entire set of hills except when a van was passing me – then, and only then, my pride wouldn’t let me walk. I don’t know what it is about this leg but each year when I reach it I am woefully unprepared. It is my shortest turnaround from the prior leg (just over 2 hours) but 10 minute miles still do not add up…it makes getting closer to a 7 minute pace for this race a tall order much less the barely sub-8 minute miles I achieved. Post-Race What-ifs: I don’t have a lot of remorse for my performance or for the performance of our team. I would like to run the race from front-to-back without walking during one leg. I think that’s worth between 5-10 minutes of total time of our race for me alone. I would like to be more strategic with my eating. Literally just after finishing my 6th and final leg of the race I read an article in Men’s Health about needing few calories than one would think to complete this race. Sometimes timing is everything. This article discussed that a diet lower in solid food and not exceeding your normal daily calorie intake on a high output day is enough for peak performance. This could be an area of improvement for next year. Sleep in the first 12 hours of the race is a mandatory improvement for next year. Being awake for 22 hours straight with the exception of a cat nap around noon was unacceptable and impacted my performance in the early night stages. Otherwise, I’d bring less food, more salty foods, and drink less Gatorade early into the event. Pet Peeve Time: Aside from the normal race chatter which annoys the snot out of me about running events (you know what I mean: “what pace do you plan to run?” or “how you feeling?” or “are you ready for this?” or “tell me about those shoes”) the only minor peeve I can come up with regarding this event is the growing trend for teams to log “Kills” or “Road Kills” on the side of their van with van markers. These are referring to the numbers of runners they have passed since starting the race. I don’t care for this. I think it is poor sportsmanship and is outwardly looking to take something away from others who are achieving great goals too. Unless you are prepared to take my name off your list when I pass you later (which most teams don’t do) and ask me on the way by whether I’m running in the same category (most teams writing this on their vans are speedy, but also full sized teams which means they get nice breaks between runs, hydration and fuel are not a concern and running 18-24 miles over the course of the event is a good bit different than running every 3 hours or so until you’ve completed the event) then you seem to be rubbing it in my face that you are running faster than me. In the history of any running race, only one person gets the honor of standing in front of the field and if they choose to, could say they were the best and fastest. The difference in this is, that one person rarely says anything arrogant or that would take away from the accomplishment of others. Running is not about the elite, while they are amazing, they aren’t as inspiring as the everyday running person who puts in their best to get a PR or place in their age group. A little sportsmanship goes a long ways. Having little sportsmanship doesn’t. I have vacated my soap box. I have not vacated my spot on this great team – here’s hoping to no one else does either (ahem John!). If for nothing else, for the great quotes that come from being stuck in a van for 35 hours with good people (“I don’t know what’s more annoying, Sutton’s endless burps or the fact that Whitney continues to be shocked by it.” -Anonymous 3rd Runner). Until next year, enjoy the pictures. I’ll log a follow-up post to capture my food log for this race. 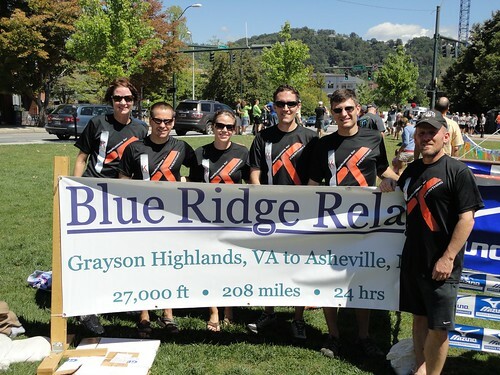 Click here for a slideshow of our 2011 BRR race. Thanks again KT Tape – you were very kind and supportive with your sponsorship of us! Only 14 more hours and we’ll be off and running! Team KT Tape, or is it Team 4tunate (to have 2 more runners), er, is it Team Snuggie? Team names are overrated. What matters is we are as ready as we are going to be to roll along the countryside for 29-30 hours in a van while one poor schlep hoofs it on foot from checkpoint to checkpoint. As in the last 5 years, we know that excitement will be very high at 3:30 in the morning when we depart, remain high until about 4:10 when everyone except driver and co-pilot conk out on their respective bench seats, then excitement will only be high for driver and co-pilot until the rest rise around sunrise and we start to remember how real the hills in the mountains really are. From there excitement turns to fear, then back to excitement when we remember the first leg is all downhill anyways. About leg 8 we will ask in a fun-loving way, “why are we doing this again?”. About leg 18 we will ask in a less-fun-loving way, “Why are we doing this again?” except the answer will blame an individual. About leg 28 we will ask 2 questions: 1) “When is the sun coming up” or maybe “is it dark for this long each night?” and 2) “why are we doing this again?” except blame will be fully agreed upon and that person will no longer receive the kind of support the other 5 people do. Finally at leg 36 in Asheville, everyone except for that poor last runner will be loving life again and talking about the first meal (little does the team know that I strategically position myself to drive so I can strategically position our first stop at a Bojangles!). The finish occurs, elation ensues and wraps up about 8 minutes later and then the team without comment will walk back to the van and all head for Charlotte. Little will be said except for the standard agreement that we will not discuss the prospect of returning for 30 days when sanity sets back in without bias. If you are running in the race – you’ll know who we are by the team wearing these shirts. The shameless plug-fest continues. We LOVE KT Tape because they love us! We get to be early adopters of their new synthetic product…cool to be an early adopter. Cooler of them to support us! 1) “The Heiskell” – this is an Army/West Point influenced approach. Eat at 6:05am, run at 8:05am. Finish running at 8:55am, immediately drink 14.6 fluid ounces of a protein, electrolyte shake, 2 cans of ravioli-a-ronis, 1 banana, 1 powerbar and 1 bottle of water. Repeat every 3-4 hours until you have run the 6th leg 30+ hours later. 2) “The Bagel” – if all else fails just always be eating a bagel when you are not running or sleeping. 3) “The Circle K” – only eat when a convenience store presents itself. This rule can be breached if someone is passing out something homemade for $5 or less. 4) “Bar-licious” – see “The Bagel” but replace “bagle” with “bar”. 5) “The I-Wonder-If-I-Am-Getting-Enough-Calories” plan – this basically means eat a great deal between 6am and 10am and then lose interest in eating the junk you bought. So instead you pump Gu gels, apples, an occasional Snickers into your body and convince yourself you are well on your way to the 4-5,000 calories the event requires. 11:30am: Oatmeal shake (oats, cinnamon, flax, banana, soy milk, almonds) via magic bullet followed by Gatorade. 2pm (Leg 8 done): Tuna, Beans, Rice mix with hot sauce with water and a banana. 8:00pm (Leg 14 done): Quiznos? Bojangles? 3:30am: (Leg 26 done): Water and baked potato from prior exchange. Maybe even a coke? 6am: Coffee, pancakes? Egg Sandwich from a convenience store? 9am: (Leg 32 done): none of the food items above!!! Suggestions? Any improvements you see that can be made? I’m all ears! That’s right – sponsored! And by one of our team’s favorite running products. KT Tape. When John runs he nearly coats himself in this stuff. The only way it would get more use by him is if they offered a paint-on application. Bottom line is this company is a big supporter of great athletic events, offer a fantastic product and best I can tell, has some great people working for the company. This tape works – it alleviates aches/pains experienced during exercise and although I’m no expert, it seems to help performance and post-race recovery. I use it mostly for achilles tendonitis on both my left and right leg (an application that is mostly around the heel of the foot with a longer piece running up the bottom of the leg from the heel) and for calf strain on my right leg (2 pieces vertically and horizontally across the leg). During my longer runs I think about how funny it would be to put a stripe of it across my forehead…that may be humor reserved for higher mileage outings as it admittedly doesn’t seem as funny while typing. Typically I go black on black for the colors but do like the idea of taping up with god’s colors (Orange and Blue). The site has some great videos on how best to apply . Once applied, I’ve worn it in the shower, for all 6 legs of the Blue Ridge Relay, and I have seen people wear it while swimming. Give this stuff a try. I’m not just saying this because they are kind enough to support our team in this year’s event either. It just plain works. Next post: Food/energy management (why do I procrastinate on this topic?). Team Names are Overrated. Food/Nutrition/Energy Isn’t. Team Low Hanging Fruit. Team 4tunate. Team 4tunate (to have 2 more runners. Actual names of our Blue Ridge Relay team in the past years. Low Hanging Fruit was a nod to mid-90s corporate speak. Still funny even today. Even funnier when I hear it being referenced in a sentence these days at work. I have made a promise to myself to just walk out and come back the next day if I ever hear it in a sentence at work with “40,000 foot level”. Team 4tunate (to have 2 more runners) was a nod to the return of sensibility. I remember how easy the race seemed the first year we ran with 6 again. That memory has long since faded. 6, in my humble opinion, is still the perfect team size. One van, everyone except the driver gets to sprawl on a bench. All good. Now this year…I think officially we are registered as Team Snuggie. This seemed like a great idea back in February/March. The start line pictures of all of us in Snuggies at the time made it seem even funnier. The practicality of the Snuggie throughout the night stages also seemed too good to pass up. I’d even be interested in the night picture with all of us in it with the reflective vests on…but I’m not sure the name will stick. That is, unless we fail to come up with something better. Any ideas?